Excerpted from Mac/Eddy Today Issue #13. Article and photos copyright ©1978, 2005, all rights reserved. Miliza Korjus, star of the MGM classic musical The Great Waltz (1938), was one of the first honorary club members and attended several club events in 1977 and 1978. 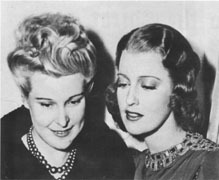 Photos: Above left, Miliza with Jeanette at the studio, either late 1938 or January 1939. Jeanette’s in costume for Broadway Serenade; she and Miliza had next-door studio dressing rooms. 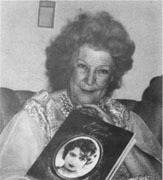 Above right: Miliza at a club event, holding the book Jeanette MacDonald: A Pictorial Tribute by Sharon Rich. Miliza told us about a party she had attended in the early 1950s (we later learned it was in honor of Kirsten Flagstad). Both Jeanette and Nelson were there with their spouses, and the meal went smoothly until just after dinner, when Ann Eddy began talking loudly about unfaithful husbands who ran around with any tramp making themselves available to him. She mentioned no names, of course, but Nelson, who had unconsciously been paying too much attention to Jeanette, turned red, while Jeanette went white. Everyone sat in uncomfortable silence, with most people unaware of what she was referring to. Nelson finally jumped up, told his wife where to go, grabbed Jeanette’s hand and pulled her from the room. Miliza also told of another party attended only by Gene and Jeanette, where Gene belligerently began talking of how he’d made Jeanette a star, how well he guided her career, etc. Jeanette just sat there, looking at her lap while he cut her down, until someone told Gene to shut up.